Milkweed bugs (actually, nymphs of various stages) feeding on milkweed pods. If you grow milkweed (Asclepias species), you will also grow milkweed aphids, milkweed bugs, milkweed beetles, and, if you’re lucky, monarch butterflies. The past few years I’ve been much more likely to see the aphids and the bugs than the butterflies, but they’re all good. All milkweeds contain cardiac glycosides, poisonous chemicals that are deadly to most creatures. All the insects that feed on milkweeds are able to do so without being poisoned because they can digest these deadly substances. Evolution is a game of one-upmanship. Asclepias plants evolve a poison that insects can’t eat, so insects evolve a way to metabolize that poison. Those protected insects benefit: they themselves become poisonous to predators. 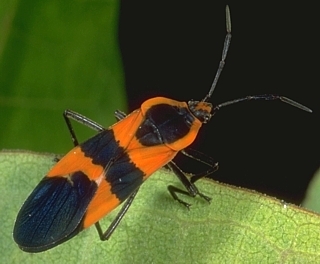 They flaunt this advantage with bright red or orange colors so their prey recognizes their defense mechanism and leaves them alone.Then other insects evolve similar coloration, but without the defense mechanism–they’re free-loading on evolution. It’s all really, really cool. Typically you see the adults mating on the milkweed pods, and about three weeks later you see a scene like the one at the top of this post: lots and lots of nymphs all over the pods. They have piercing mouth parts, which they use to feed on the seeds within the pods. They destroy the pods they feed on, meaning that perhaps 10 percent of the seed in my garden is lost. 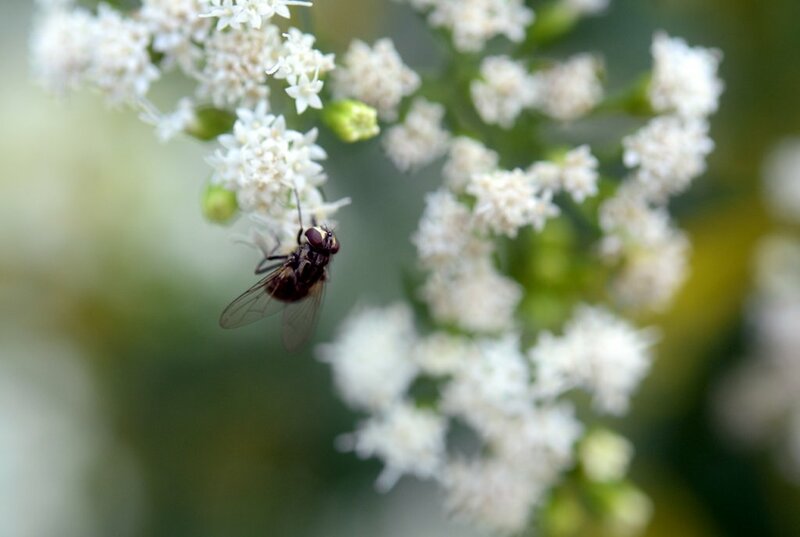 There’s still plenty to collect, and the bugs don’t harm the plants in the slightest. And they’re so very, very cool looking! The perennial border today, still in bloom despite the drought. Below is a wider view of the perennial borders that surround the patio (sadly, we put the patio furniture away this morning). You can see the different colors of the two aster species; on the right,you can see the white and yellow of white snakeroot and goldenrod that volunteer from the miniforest that’s just outside the picture. And aren’t the grasses lovely in the sun! Aster oblongifolius ‘Blue Skies.’ Like all asters I grow, it it producing smaller, more intensely colored flowers this year, although the blossoms are as numerous as usual. Drought and more drought. Some plants look sick, some look tired, some look just fine. Trees that are diseased or are near the end of their lifespan are particularly affected (basically, all living things react similarly to stress), but all properly sited, well-established plants should survive. However, if you had planned on major fall planting or lawn renovation, you should probably put it off until next year. It finally feels a bit like fall, with cool evenings and mornings and hints of color in some trees and vines. Sugar maples are showing orange and yellow, Virginia creepers flaunting red. But colors will probably be somewhat subdued this fall compared with the past two years. — water new plantings: newly installed plants and annuals, like vegetables, need watering. Any week in which we receive less than an inch of rain, water all woody plants installed this spring or last season. Perennials planted last spring should be well-established, but those planted last fall and this spring need supplemental watering during dry spells, and this season is one long dry spell. How do you know when you’ve provided an inch of water? An old yogurt container placed on the ground among the plants makes a great rain gauge. A tunafish or catfood can works equally well. — warm-season crops such as tomatoes, peppers, squash, eggplant, beans, corn, and cucumbers are winding down. 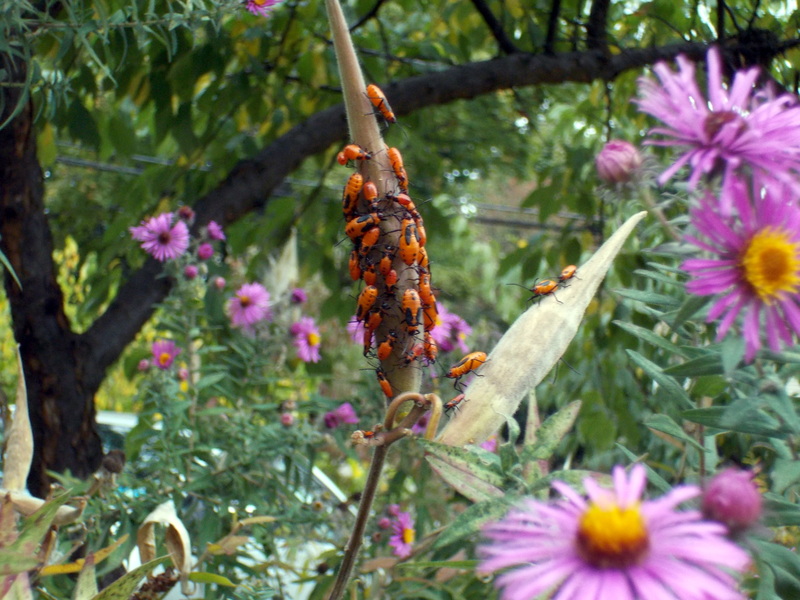 Continue to practice good horticultural techniques: monitor for insect eggs and larvae and remove pests before infestations become serious. Throw out badly infested or diseased plants to prevent the spread of disease (do not compost diseased or infested plant material). Clean up carefully as each crop finished producing. This year’s diseased plants, left in the garden, are the source of next year’s infections. — As tomatoes continue to ripen their fruit, cut back on watering to avoid split fruits. Keep removing suckers. At this time of year particularly, signs of fungal diseases appear. Look at this post, this one, and this one for basic information about growing tomatoes. — Tend the fall vegetable garden: if you seeded second crops of cool-season plants like peas, lettuce, and spinach, keep them well watered, especially as they begin to germinate. It’s about 3 weeks until our average first frost date! I have been harvesting a delicious fall crop of arugula. — follow a sustainable lawn care regimen: if you feel you must fertilize your lawn, best practice is to give it no more than two applications of slow-release organic fertilizer each season, around Memorial Day and Labor Day. However, if you can’t water, don’t fertilize. — Similarly, don’t reseed bare areas until you can water. Better still, if you have a place where grass won’t grow, plan to plant something that will, like shade-loving native perennials. Measure and mulch the bed now so you’re ready to plant in spring. — Hold off on fall planting. If you can’t water, don’t plant. Newly installed perennials, shrubs, and trees need frequent and thorough watering. But remember, there’s always next year! Almost all lawns are dormant now, and you probably haven’t mowed in weeks (yay! ), but the grass will green up as soon as we get some rain. The only grasses that are really green are crabgrass and foxtail grass, both considered to be weeds. But you’ve got to admire their stamina. Enjoy the garden this week, and pray to whatever god you pray to for a little rain. White snakeroot (Ageratina altissima) is a late-blooming native that volunteers throughout our area. I welcome it as a great source of pollen for insects of all kinds. Can anyone identify this creature? 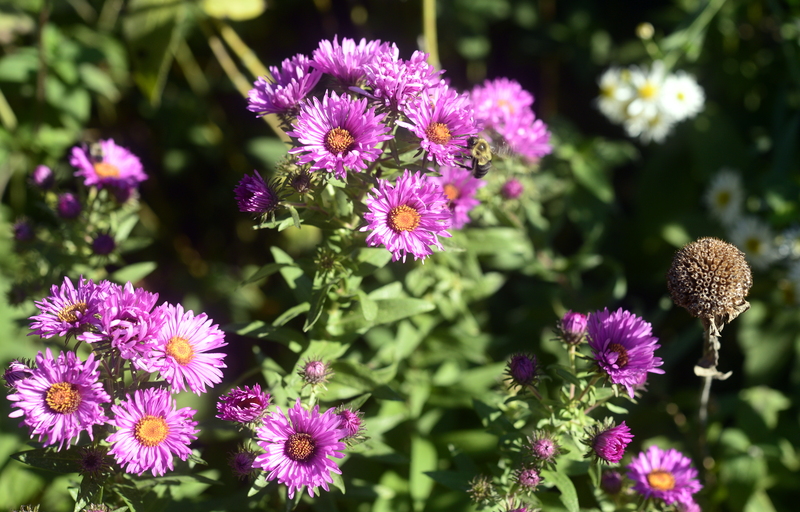 Despite the drought, New England asters are putting on their usual autumn display, although individual flowers seem a bit small than usual this year. If your water company is Ridgewood Water, you’re still under Stage IV watering restrictions. Here in Glen rock, that means hand watering only on odd/even days. Other local water companies have imposed voluntary restrictions, but those could turn into mandatory ones at any time. It’s been a very dry growing season, and that changes most people’s fall planting and maintenance plans, as I’ll describe below. — water new plantings: newly installed plants and annuals, like vegetables, need watering. Any week in which we receive less than an inch of rain, water all woody plants installed this spring or last season. Perennials planted last spring should be well-established, but those planted last fall and this spring need supplemental watering during dry spells, and this season is one long dry spell. How do you know when you’ve provided an inch of rain? An old yogurt container placed on the ground among the plants makes a great rain gauge. A tunafish or catfood can works equally well. — practice good horticulture with warm-season crops such as tomatoes, peppers, squash, eggplant, beans, corn, and cucumbers: Continue to monitor for insect eggs and larvae and remove pests before infestations become serious. Throw out badly infested or diseased plants to prevent the spread of disease (do not compost diseased or infested plant material). As the garden winds down for the year, clean it up carefully. This year’s diseased plants, left in the garden, are the source of next year’s infections. — As tomatoes continue to ripen their fruit, cut back on watering to avoid split fruits. Keep removing suckers. At time of year particularly, signs of various fungal diseases appear. Look at this post, this one, and this one for basic information about growing tomatoes. — Tend the fall vegetable garden: if you seeded second crops of cool-season plants like peas, lettuce, and spinach, keep them well watered, especially as they begin to germinate. It’s about 4 weeks until our average first frost date! 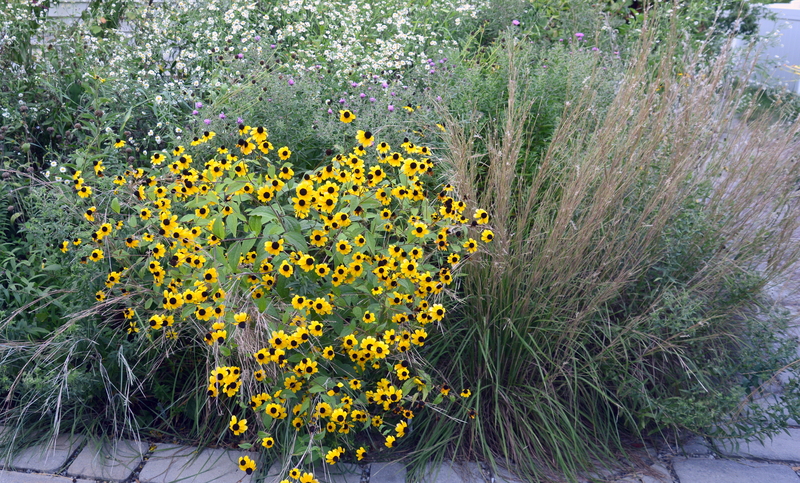 — Similarly, don’t reseed bare areas until you can water. Better still, if you have a place where grass won’t grow, plan to plant something that will, like shade-loving native perennials. Measure and prepare the bed now so you’re ready to plant in spring. — Almost all lawns are dormant now, and you probably haven’t mowed in weeks (yay! ), but the grass will green up as soon as we get some rain. Mine showed signs of life after it rained last week. 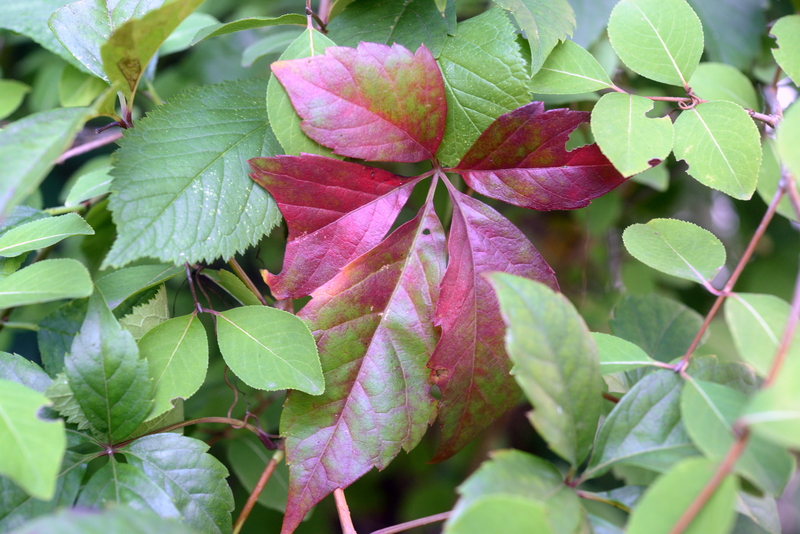 Virginia creeper is beginning to show some color, but the display is not as brilliant as it was in the last two years, which had unusually cool autumns. Just a quick post, mostly an update on the water situation. Yesterday and overnight we finally got some much-needed rain, but it was considerably less than necessary to ease the drought. My rain gauge registered just over an inch of water, or approximately one normal week’s rainfall. At least you don’t have to water the vegetable garden or planters for a couple of days! But customers of Ridgewood Water are still in Stage IV watering restrictions, meaning hand-held watering only. If you get your water from a different company, check their website for the current status. And hold off on fall planting or lawn reseeding or fertilizing until those restrictions ease. 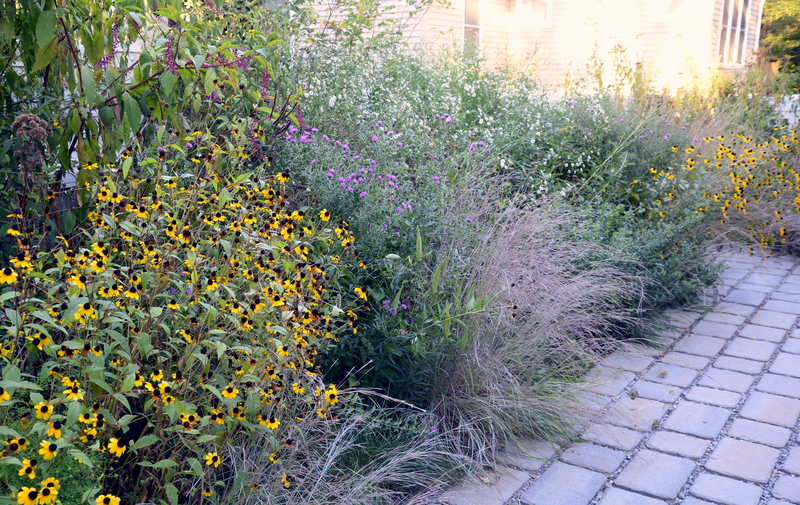 This border of sun-loving native perennials and grasses still looks good despite a summer of drought. Except for June, we’ve had unusually low rainfall for every month of this growing season: less than 2″ per month, when our normal monthly rainfall is 4-5″. Ridgewood Water, the small company that serves Glen Rock, Ridgewood, and a couple of other local towns, has just imposed Stage IV water restrictions, which means pretty much no watering at all. All the more reason to plant native plants in future. Once well established, properly situated native plants can stand up to normal drought cycles without supplemental watering. A wider view of the same border. The little bluestem (grass) shows particularly lovely color this year, but the asters are not as floriferous as usual, and some species are blooming late. 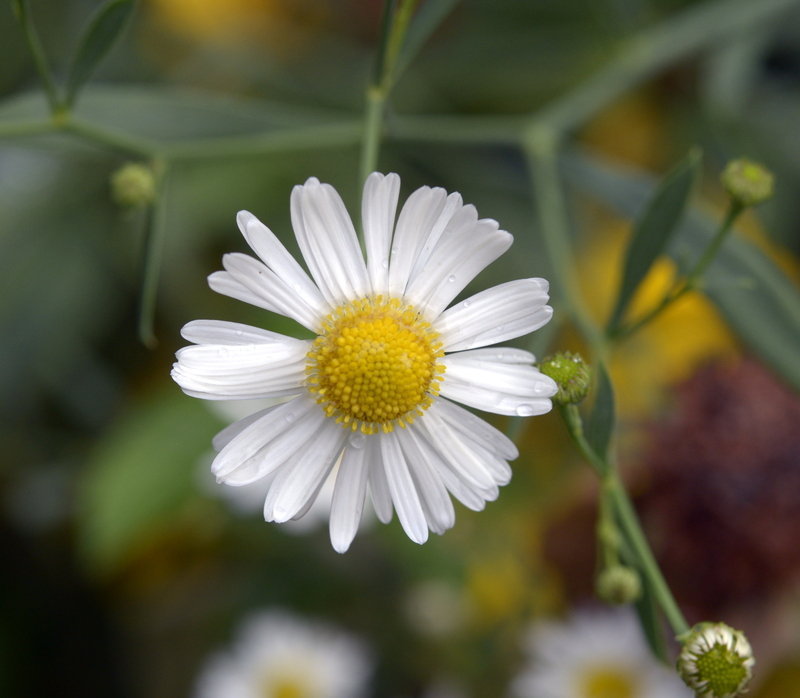 Boltonia (B. asteroides) is one of the few plants that looks as good this year as it does in a year with closer to average rainfall. Individual flowers are about 1″ across; the plants have thousands of flowers and are about 6′ tall. It’s been so dry that, frankly, my garden doesn’t look all that great. True, late-season perennials (Rudbeckia, Boltonia, great blue lobelia, asters, goldenrod, various Eupatoriums) and grasses are blooming almost as enthusiastically as ever, even if some are rather late. 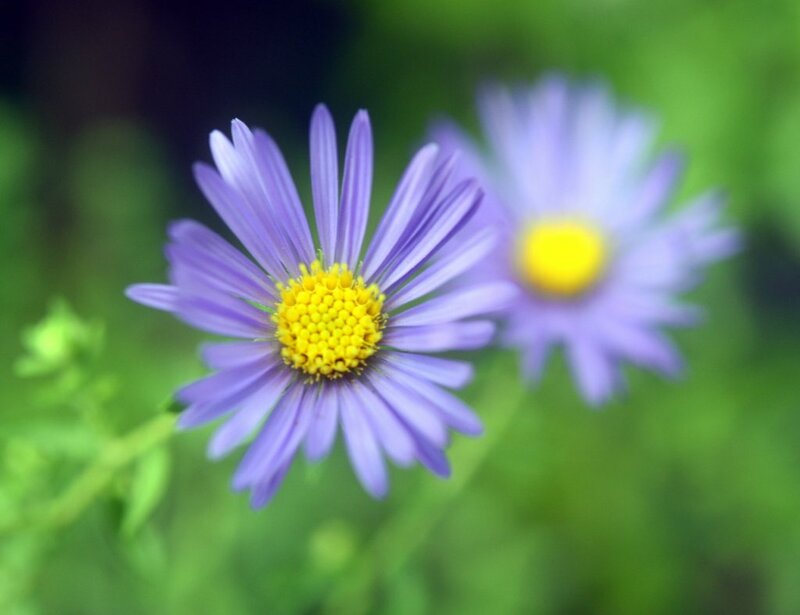 But foliage generally looks tired, early-blooming perennials are setting seed early, and woody plants are showing many signs of drought stress, such as drooping leaves, heavy or early seed set, dropping lower leaves, and brown leaf margins. (Of course, if you go for a groomed look rather than a natural one, you would have watered regularly, and your garden would look lush and lovely now.) My husband, who takes almost all the photos I use here and for my talks, hasn’t felt inspired to go outside and document the garden. The photos above and below were taken last year. — As tomatoes ripen their fruit, cut back on watering to avoid split fruits. Keep removing suckers. At time of year particularly, signs of various fungal diseases appear. Look at this post, this one, and this one for basic information about growing tomatoes. — Tend the fall vegetable garden: if you seeded second crops of cool-season plants like peas, lettuce, and spinach, keep them well watered, especially as they begin to germinate. It’s about 6 weeks until our average first frost date! — it’s not too late to extend a garden bed or start a new one, and it’s always a great idea to eliminate some lawn: spread a 3-4″ layer of cedar or hemlock bark mulch over the area to kill the grass. Next spring, you’ll be able to plant right through the dying grass and mulch. I mulched an area of lawn during the summer and am scattering perennials seeds there as they ripen. — follow a sustainable lawn care regimen: if you feel you must fertilize your lawn, best practice is to give it no more than two applications of slow-release organic fertilizer each season, around Memorial Day and Labor Day. However, because the weather is so hot and dry, hold off for about a week, and don’t fertilize when the soil is dry. 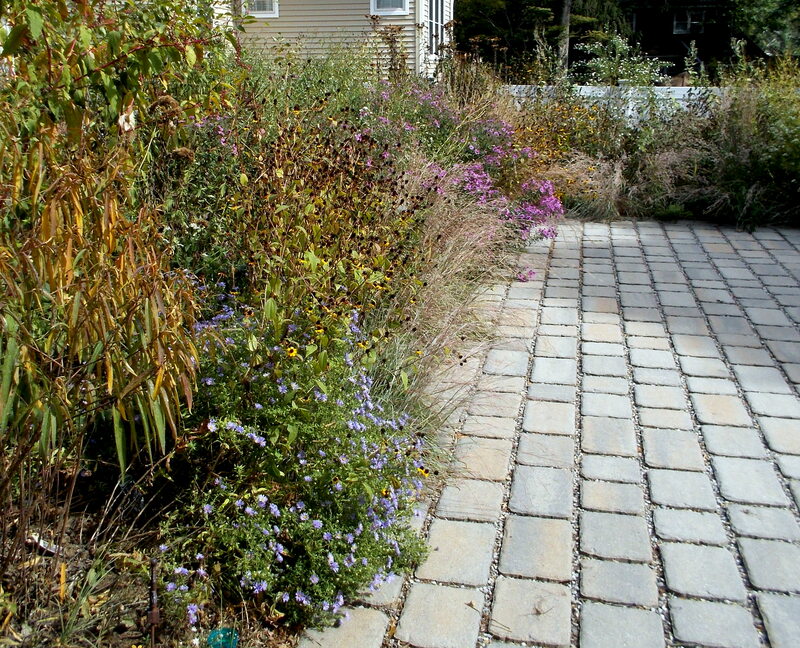 — Similarly, hold off on reseeding bare areas until the weather cools off a bit. Better still, if you have a place where grass won’t grow, plant something that will, like shade-loving native perennials. — Let the grass grow at least 3″ tall for maximum photosynthesis. Lawns do not need water now (or ever), but if you do water, do it infrequently and deeply to encourage deep root growth. One inch of water once a week is much better than a few minutes each day (watering every day is likely to cause fungal diseases). But remember: the more you water, the more you’ll have to mow! If you follow my advice and hold off on watering entirely, your lawn is dormant now and you probably haven’t mowed in weeks (yay! ), but it will green up as soon as we get some rain. Take heart: the heat is predicted to end in less than 10 days! And in the meantime, happy Labor Day. 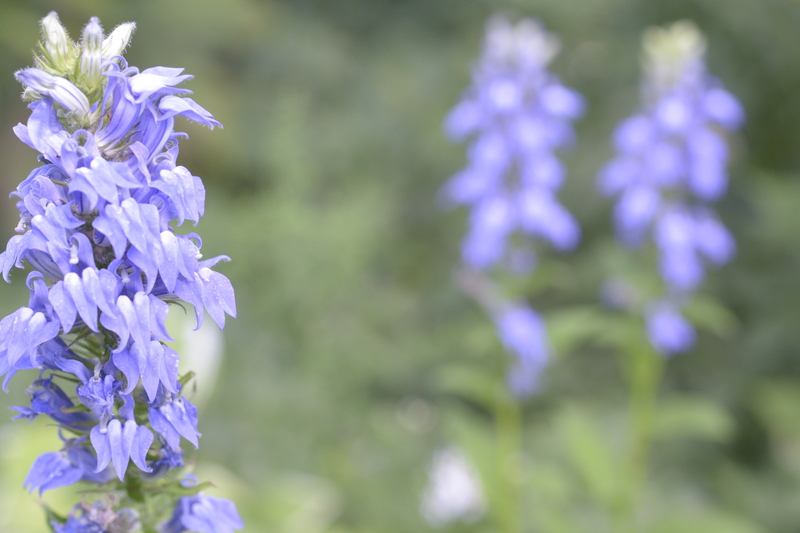 Great blue lobelia (Lobelia siphilitica), in a photo also taken last year. I can’t say that it looked quite as good this year, but it certainly bloomed nicely and has now set seed.